This was a seven day cruise to the Western Caribbean from Fort Lauderdale, Florida. The ship called at Labade, Haiti, Falmouth Jamaica and Cozumel, Mexico. The cruise experience offered on Harmony of the Seas is a family-friendly experience. Harmony offers a diverse array of sports facilities, entertainment, and dining venues. It is generally relaxed but there are opportunities to dress for a somewhat more formal evening. Passengers range in age from children to seniors. There is also a mix of nationalities. Harmony of the Seas is an amazing ship. She is so much bigger than other cruise ships that just the sight of her is impressive. But going beyond the size, there are so many things to do on her in terms of entertainment, sports and dining that she is just extraordinary. Harmony is the world's biggest cruise ship. As result, the question that people often ask about Harmony is whether she is too big? Just before I cruised on Harmony, I had taken a cruise on one of Royal Caribbean's smaller ships. Whereas the smaller ship had a small town atmosphere - - relaxed, open and friendly - - the atmosphere on Harmony was like that of a major city. Guests were a little more distant and the staff were very focused on getting their jobs done. However, as in London or New York, when you had the opportunity to speak with them, you found that the guests and staff on Harmony could be as friendly as people anywhere. With more than 6,000 guests aboard, people who have not cruised on an Oasis class ship are often worried about being swamped by a sea of humanity. 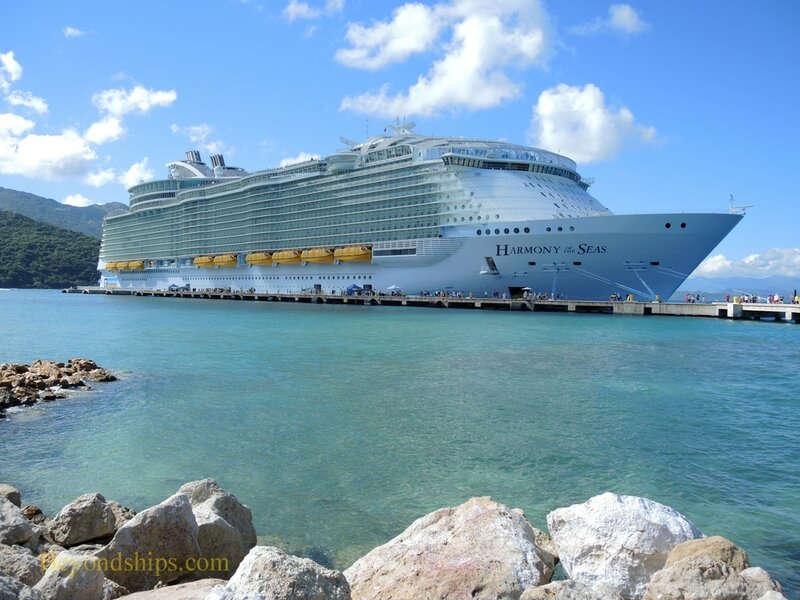 Royal Caribbean has done a very good job, however, on managing the passenger flow. Because there are so many things to do on the ship, people spread out. Thus, you can be among a handful of other people listening to a classical guitarist in the pace of Central Park in the evening. On Harmony, I did encounter more lines than I remember encountering on either Oasis or Allure. This happened chiefly in the main dining room during the open seating breakfast and lunch (sea days) and during the flexible dining dinner hours. However, thinking about it in retrospect, these lines were at the most popular mealtimes. On almost all cruise ships, there are lines at the most popular mealtimes. In any event, the compensating factor on Harmony is that there is so much to do. Because of its size, Harmony can offer so many alternatives when it comes to dining, entertainment, sports, and activities. Indeed, even just walking around the ship and seeing all the alternatives it has to offer is an interesting activity. Since this is the third ship in the Oasis class, a natural assumption is that Harmony is just like her sisters, Oasis of the Seas and Allure of the Seas. Clearly, the overall concept and the basic layout of the ships are the same. However, there have been some changes such as the addition of several features that made successful debuts on Royal's Quantum class ships such as the Bionic bartenders and the specialty restaurants Jaime's Italian and Wonderland. Behind the scenes, there have also been changes. Changes to the hull design and the mechanics of the ship make Harmony both faster and more fuel efficient. On this voyage, she seemed to cut through the water quite well giving a very smooth ride. There are three main entertainment venues on Harmony - - the main theater, the aqua theater, and the ice rink. Each venue has two main shows. One of the shows in each venue is reservations required while the other show is first come, first served. (It should be noted that if there are seats remaining after all the guests with reservations have been seated, guests on standby are seated). The reservations required show in the main theater is a version of the popular musical “Grease.” Its companion is “Columbus,” a musical comedy developed internally by Royal Caribbean. (In addition to the two production shows, the Royal Theater hosts shows by visiting performers as well as 3D movies). The ice rink has a show called “1887” set in 19th century Paris. The protagonist is transported into various eras and fantastic locales during the course of the show. A projection system transforms the surface of the ice so that it looks like a river packed with broken ice, a palace ballroom floor, and outer space. The other show in the ice rink is a more traditional ice skating performance. The aqua theater has the “The Fine Line,” a production with no discernible plot line. Instead, it is a dream-like chain including unusual dancing, aerialists and of course, swimming and diving. The second show in the aqua theater was a musical set in the 1950s. All of the shows were professionally performed and engaging. Indeed, the performances in the aqua theater were quite spectacular. I found 1887 and The Fine Line to be rather dark visions, much different than the shows Royal Caribbean typically offers. The organized activities were standard cruise ship items such as trivia quizes and bingo. As a family-friendly ship, the activities on Harmony tend towards the light-hearted, e.g. the international belly flop competition. There was no enrichment program. Harmony has two main dining rooms. One is for guests staying in certain suites (Grand Suites and above) and the other is for everybody else. The main dining room for the suites is the Coastal Kitchen. It is located in what was called the Viking Crown lounge on earlier Royal Caribbean ships. With floor to ceiling windows, it offers panoramic views over Central Park and the forward half of the ship. Open for breakfast, lunch and dinner, the dinner menu changes each night. By invitation, I dined in Coastal Kitchen one evening. Essentially, it was like dining in a specialty restaurant, a premium experience. The buttered poached lobster was creamy and tender. Similarly, the seared scallops were very good. The portions were not large, the enjoyment coming from quality rather than quantity. (Of course, you can place multiple orders if you so desire). I also liked the individual size Baked Alaskas - - a passenger ship tradition. The service was good, again similar to a specialty restaurant. The dining room for the vast majority of passengers is a huge room with a main floor and two balconies. Each of these the three sections has its own name and décor but all three follow the same menus. The entire room is open for dinner with one section devoted to the traditional passenger ship dining system and two to Royal's flexible dining system. Only one section is open for breakfast and lunch (sea days). I liked the quality of the menus. (See menus page). They included such favorites as filet mignon and lobster tails as complimentary items. I was also delighted to see lobster rolls on the lunch menu. They are usually an extra-tariff specialty item on most ships. Even though I had selected the flexible dining option and did not request to have the same table each night, an effort was made to seat me with the same waiters each evening. One of the most frequent criticisms Royal received with regard to the ill-fated Dynamic Dining concept tried out on the Quantum class ships was that guests missed having the same wait staff each evening. Having listened to that criticism, Royal apparently is trying to meet this desire even in its longstanding flexible dining program. The service was friendly and attentive. Dining on Harmony is not just about the main dining rooms. There are an array of specialty restaurants as well as a number of casual dining alternatives. The Park Cafe in Central Park offers sandwiches, pastries and made-to-order salads. It is so popular that it is difficult to get a seat there even on port days. I also liked the design your own pizza option at Sorrentos. This is not a new concept at Royal Caribbean but the team aboard Harmony for this cruise had mastered the concept. Harmony is well-equipped for those seeking physical activity. Features include two rock climbing walls, surfing simulators, a zip line, a basketball court, miniature golf, a bevy of pools as well as the aforementioned slides. There is also a large, well-equipped fitness center. One feature that is often overlooked on the Oasis class ships is the jogging trail. On most cruise ships, the jogging trail is a path marked out on the upper deck. Runners have to make numerous loops because the trails are usually quite short. In addition, it is an obstacle course, twisting between the sun loungers. On Harmony, the jogging trail encircles Deck 5, making for long straightaways. In addition, it is unencumbered by deck furniture and other cruisers. For most of its length, the view is obscured by the lifeboats but occasionally it opens out offering great vistas. It is the best running track at sea.